In 2003, when the Cubs last made it to the playoffs, I lived in Chicago. In 2007, I live in Germany, and I have to wake up at 6am to catch the end of the game on a 4 inch window on my computer, using mlb.tv (which is actually kind of cool). 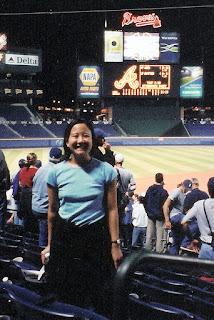 Still, not as cool as this: Saturday, October 4, 2003, I'm leaving my parents' house and the Cubs are losing the 4th game of the National League Divisional Series with the Atlanta Braves, when I get a call. Game 5 is Sunday night. In Atlanta. Tickets have been purchased and there's a spot for me. We leave at 5am, drive 13 hours to Atlanta, straight to the stadium. The Cubs win 5-1, Kerry Wood is the winning pitcher. Afterwards, fans mill around the Cubs dugout and cheer. When we're done, we get right back in the car and drive 13 hours back to Chicago. DY - Thanks! Definitely my best moment as a Cubs fan. And I guess Joe Torre saved his job for one more day. Yeah, those were the days. Your FINEST moment as a Cubs fan, but one of my FIRST. I didn't even have a Cubs hat back then, bought one as soon as we got back to Chicago. Now that hat is so beat-up, I'm retiring it to sports-only duty. Andy - Those definitely were the days; now there's nearly no one I know left in Chicago.